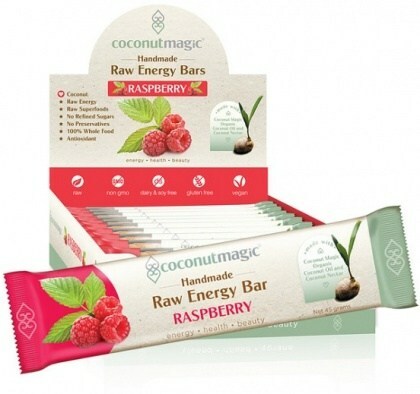 Coconutmagic Raw Raspberry Energy Bars is the perfect health snack that provides a natural boost of energy as each bar is made with premium organic virgin coconut oil and coconut flower nectar. What is great about Coconutmagic Raspberry Energy Bars is that all the organic ingredients such as dates, almonds, and coconut contribute to regulating your bowel movements, reducing heart disease, and providing your body with a daily dose of essential vitamins, minerals, and fibre. With every bite of Coconutmagic Raspberry Energy Bars, enjoy the berry burst of raspberry flavour that is naturally sweet and contains a whole heap of antioxidants. Ingredients: Dates, Pesticide-free Almonds, Coconut, Goji Berries, Cashews, Raspberry Powder, Coconut Nectar, Coconut Oil.